This week’s feature was written by CUESA volunteer Juli Chamberlin. The farmers’ market is a vibrant place–there are so many colors, shapes, smells and tastes to turn your head and dazzle your senses. 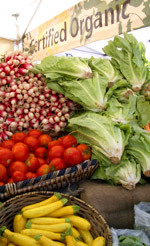 The diversity of fresh foods is an important part of how farmers’ markets sustain interest for everyone who ambles, nibbles and comes away laden with the season’s bounty. This impressive variety of food we bring to our tables is rooted in an equally impressive biodiversity on the farm. 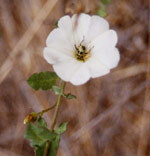 Biodiversity is a term often used in the context of global ecosystems. Hearing it, you may envision great landscapes like arctic tundra and tropical rainforests. You might picture charismatic mammals like tigers, polar bears, and caribou. It turns out, though, that biological diversity is just as significant for the farm ecosystems whose abundance we relish every week at the market. Plants and animals on farms thrive under the same conditions that memorable members of the rainforests do: through complex relationships with plants, fungi, and creatures both great and microscopic. Food crops and pasture are much better nourished by soil that is teeming with communities of microbes than by dirt devoid of microscopic life. A farm with wild spaces, many crops, and diverse animal species keeps pests on their toes. The diversity attracts beneficial predators to prey on the pests that do (and they usually do) find their favorite meal on the farm. Diversity also makes good economic sense; from the soil to the market, it pays to keep things interesting. If a farmer’s sweet corn doesn’t do well or prices fall because everyone’s corn crop did brilliantly, having unusual varieties and other crops to bring to market balances out this setback. Simply put, the more genetic and species diversity that is present on a farm, the greater the likelihood that at least some crops and livestock will survive the inevitable and unknown challenges of farming: unpredictable weather, pests, parasites, diseases, and price fluctuation. In a sense, incorporating biodiversity on the farm is like placing a bunch of little bets rather than one big one, as Dan Lehrer of Flatland Flower Farm aptly states. Dan also reminds us that there are other reasons to champion farm biodiversity. When farmers leave parts of the land wild, or plant ornamental and native plants, non-farm wildlife can co-exist with and be of benefit to farms by pollinating crops and preying on pests. Javier Salmon of Bodega and Yerba Santa Goat Cheese strives to keep his farm as interesting as possible. Several goat breeds, including Nubian, Saanen, and Alpine, graze on pasture much of the year. They rotate every couple days between diverse pastures, some with wild-growing herbs (mugwort, yerba santa, chamomile, and bay laurel), others seeded with alfalfa and mixed with native grasses. The farm is also home to a walnut orchard, an herb and flower garden, a small Petit Syrah vineyard and bee hives. The bees pollinate the flowers and walnut trees, which, along with the herbs and wine made from the grapes, are used in Javier’s 10 kinds of cheese. The farm’s diversity also serves a medical purpose: the goats are treated with herbs from the garden for common issues like mastitis (comfrey and olive oil compresses) and worms (green tobacco). Supporting small diverse farms by buying the food they produce is a tasty way to celebrate life’s variety. For both practical and philosophical reasons, farmers’ market growers often choose to “let what’s already there be a part of the farm,” as Dan Lehrer says, and follow the wild’s example by growing not just a couple crops or a herd of cattle, but a small ecosystem.